President Obama is preparing to leave the White House, and he's heading out in style. The United States' first family will be hosting a goodbye bash tomorrow (January 6), and the rumoured guestlist is making it sound like a party for the history books. 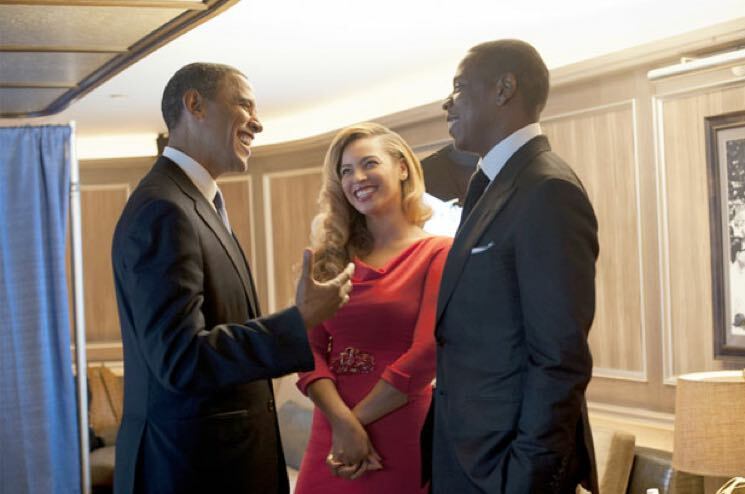 As various insiders have told the Washington Post, names like Jay Z, Beyoncé, Stevie Wonder, Bruce Springsteen, Eddie Vedder, Paul McCartney, Usher and Chance the Rapper have been tossed around as possible performers, while Samuel L. Jackson, Oprah Winfrey, J.J. Abrams, George Lucas, Bradley Cooper are also apparently on the guest list. Official plans for the send-off soiree aren't expected to be revealed until tomorrow, but Chance the Rapper has at least confirmed that he will be in attendance. Tomorrow's party will be the cherry on top of a presidency that has seen Obama slow-jamming the news with Jimmy Fallon and the Roots, guesting on a Coldplay album, paying homage to Ray Charles with performances by Alabama Shakes' Brittany Howard, Usher, Leon Bridges and more, and ringing in the Fourth of July with sets from Kendrick Lamar and Janelle Monáe — not to mention earning hipster cred with appearances at South by Southwest and his personally curated playlists. First Lady Michelle Obama, meanwhile, recently kicked it with Missy Elliott and James Corden for Carpool Karaoke.